(STATS) – Sam Houston State is so used to dominating opponents with its quick-starting ways, but the national FCS power will be playing catch-up in the Southland Conference race. The No. 11 Central Arkansas Bears turned the tables on the No. 3 Bearkats and held on for a 41-30 victory on “The Stripes” of Estes Stadium in perhaps the most pivotal game of the Southland season. Central Arkansas improved to 3-1 overall and 2-0 in the Southland while ending a three-game losing streak to Sam Houston, which fell to 3-1 and 1-1. 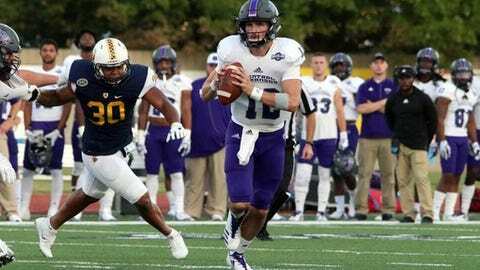 “If you want to win the conference, you’ve got to beat Sam Houston,” said Central Arkansas senior quarterback Hayden Hildebrand, who passed for 294 yards and four touchdowns. Central Arkansas built as much as a 34-17 lead in the third quarter before Sam Houston quarterback Jeremiah Briscoe threw touchdown passes on back-to-back possessions to pull the Bearkats within 34-30 in the fourth quarter. But a botched snap on a punt set up Central Arkansas deep in Sam Houston territory and Hildebrand turned it into a 17-yard touchdown pass to Brandon Cox for a 41-30 lead with 8:34 left. Coach Steve Campbell’s Bears never trailed in the game, and it didn’t take long for them to take a lead as Tremon Smith intercepted Briscoe on the game’s opening drive and scored off a 42-yard return. But it was explosive plays in Central Arkansas passing game that fueled a 31-17 halftime advantage. Hildebrand averaged 29 yards on his eight completions in the half, including 25- and 46-yard touchdown passes to Cedric Battle and a 74-yard score to Brandon Myers. It was a lot different from what Sam Houston was used to in the first half of games the last two seasons, including outscoring this year’s first three opponents 37-9 in the first quarter and 109-40 by halftime. Sam Houston came into the game averaging 52.3 points and 574.3 offensive yards per game. Briscoe, the 2016 STATS FCS Walter Payton Award winner, completed only 22 of 50 passes (44 percent) for 303 yards, three touchdowns and two interceptions, both by Smith. Briscoe’s final score was his 84th career TD pass, tying Brian Bell for the school record.